In August of this year, I visited the Minneapolis Institute of Art. We only had three hours until we had to catch a flight, so my father, my uncle, and I agreed that we should choose to focus on just a few of the galleries. I had visited the top floor — with mostly European art and contemporary art — a few years back. Besides, I wasn’t too excited about the prospect of seeing yet more eighteenth- and nineteenth-century Western paintings. So, instead, we walked through the lower floor. There was an exhibition of Dakota art, but soon enough I drifted over to the side of the floor devoted to Asian art. The collection of the Minneapolis Institute of Art was phenomenal. What I want to do here is stop and think about this statement I just made: what was it that I liked so much about the Asian art in the MIA, particularly in terms of its relationship with nature? And what, if anything, does this have to do with the geoaesthetics of Daoism? 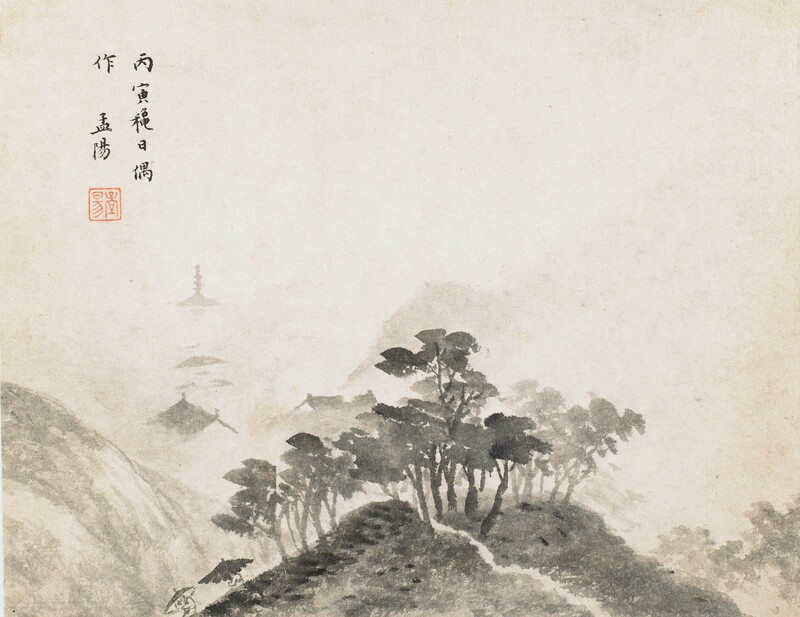 The exhibition that I saw at the MIA is entitled Enchanted Mountains: Chinese Landscape Painting from Mia’s Collection. The website description says that the exhibition “reveals the rich imaginations and sensitivities of Chinese landscape painters through a variety of artistic styles.” What I remember most was the diversity of items on display. There were, firstly, landscape paintings like the ones that preoccupy Guo Xi. Some of these were displayed in a room that was furnished and constructed to resemble a scholar’s study. In this case, the room and its accompanying garden was called the Studio of Gratifying Discourse, originally from the West Dongting Hills district of Lake Tai in the village of Tangli. Among the fronds of bamboo in the garden were a few gongshi, or scholars’ rocks, many of which came from Lake Tai. One of the rocks even had little white veins among the peaks that immediately made me think of the glaciers I had just been visiting in Montana. In short, I found these rocks so beautiful. The interpretation I want to try for my reaction is that suggested by the title of the exhibition, Enchanted Mountains. Perhaps what viewers find so appealing about gongshi is the sense of enchantment: being drawn into a different world, one where mountains are the size of garden rocks and are provided solely for our contemplation. This dovetails well with what I read as being Guo Xiang’s point in his commentary on the Zhuangzi: to lose oneself in the flow of the world, to do nothing (wuwei), so that we “leave [things] alone and principle (li) will be perfectly realized” (387). What better way to achieve this end than through gongshi? Apart from the scholar’s study, the MIA also has many beautiful sculptures. 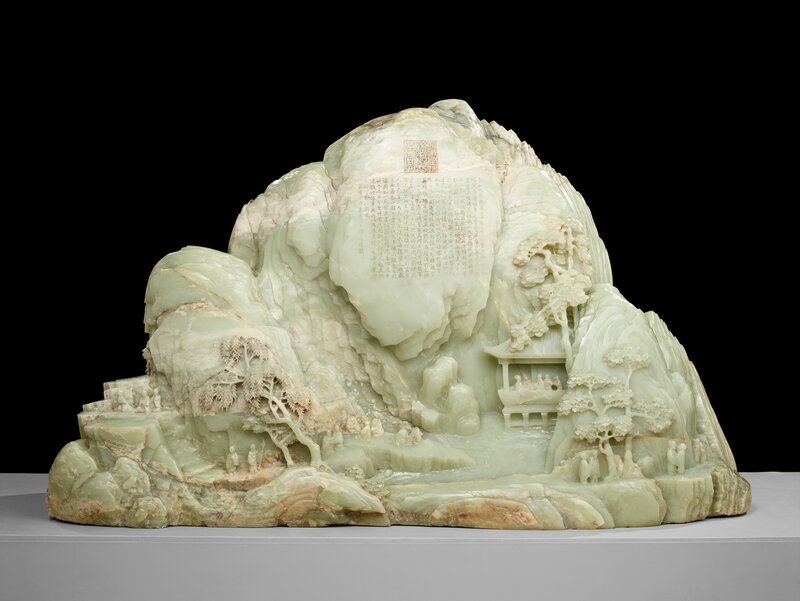 Among these is a Jade Mountain Illustrating the Gathering of Scholars at the Lanting Pavilion (apparently the largest jade carving outside of China). 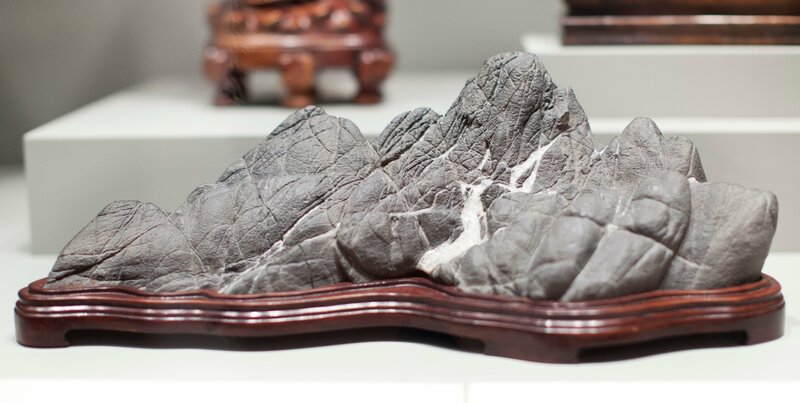 It is in effect a combination of landscape painting and gongshi: a three-dimensional depiction of a mountain landscape — thus combining the three types of distances Guo Xi articulates in The Lofty Message of Forest and Stream (Linquan gaozhi) (high, deep, and level) — that also makes the most of the natural striations and imperfections of the jade. It is, in short, the epitome of an enchanted mountain.